Three Weeks with Lady X won the 2014 RT Reviewers’ Choice Award for Best British Isles-Set Historical Romance! 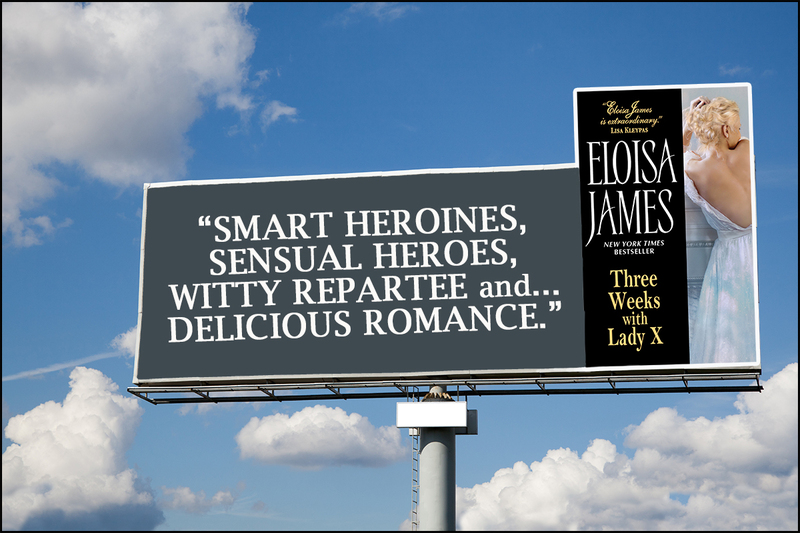 Three Weeks with Lady X is nominated for Best British Isles-Set Historical Romance and Book of the Year from RT BookReviews. Three Weeks with Lady X is listed on Amazon’s Best Books of the Year 2014: Romance. Three Weeks with Lady X has been nominated for the prestigious Kirkus Prize. Sara wrote me to point out that Vander has sisters in Three Weeks and no sisters in Four Nights. Ouch! I just wrote to my publisher and changed his mention of sisters playing with paper dolls to cousins—but in case you’re reading an earlier edition, imagine young cousins busily cutting out dolls. This Audio Excerpt for Three Weeks with Lady X, narrated by Susan Duerden, begins where the book begins, with Chapter One. Enjoy! Xenobia is an unusual name, and many readers have asked me about it. While writing the novel, I realized that this particular heroine needed to have an exotic name that gestured toward a very strong woman. Xenobia/Zenobia was a 3rd century Queen of the Palmyrene Empire in Syria, who led a famous revolt against the Roman Empire. Lady Xenobia India’s parents were the proverbial grasshoppers: they loved life, and their daughter, but they never calculated the effects of their actions. Those would have been hard names for a young girl to carry into polite society, but India proved more than capable. Enjoy these gorgeous downloadable bookmarks featuring Three Weeks with Lady X! Click to download, cut them out and share them, or leave the pdf whole as a collectors' item. Whatever she came up with, would be better than an utterly inappropriate shriek ofBloody hell, not again! Daughters of marquesses—even deceased and arguably mad marquesses—did not shriek. More’s the pity. Dibbleshire’s head swung up and he peered at India. He blinked rapidly at this idea, clearly reconsidering his infatuation now that he’d learned the object of his adoration was four years older than he. India suppressed the instinct to pat the corner of her eyes for wrinkles and composed her face to look old. Almost elderly. Presumably her white-blond hair would help; Adelaide was always pestering her to tint it one color or another. “Lord Dibbleshire, I shall hold your proposal sacrosanct, enshrined in my memory.” She held her breath. His love for her was dead. A few moments later India walked upstairs to a small sitting room that Lady Dibbleshire had designated as her and her godmother’s retreat during the renovation process. Catching sight of herself in a mirror, she peered closer to see whether wrinkles indeed radiated out from her eyes. She couldn’t see any. In fact, at twenty-six, she looked fairly the same as she had at sixteen: too much hair, too much lower lip, too much bosom. There was no visible sign of the hard knot in her chest, the one that tightened every time she thought about accepting a proposal of marriage. She was good at refusing men. It was the idea of accepting one that made her feel as if she couldn’t breathe. But she had to marry. She couldn’t go on like this forever, moving from house to house, dragging her godmother with her. After she had been orphaned at fifteen and sent to live in Adelaide’s disordered, chaotic house, India had quickly realized that if she didn’t organize her godmother’s household, no one would. And after Lady Adelaide had lavishly praised India to one of her friends, boasting that they would pay a visit that summer and “straighten everything out,” India had tackled the friend’s household as well. One thing had led to another, and for the last ten years she and Adelaide had made two or three such visits a year. It was exhilarating to create order from chaos. She would renovate a room or two, turn the staffing upside down, and leave, knowing that the household would run like clockwork—at least until the owners mucked it up again. Every house presented a different—and fascinating—challenge. But it was time to stop. To marry. The problem was that having sifted through so many households, she had received an intimate view of marriage without seeing anything that particularly recommended the marital state… except children. That had been the hardest part of her job, finding nannies and refurbishing nurseries for young women her own age. Her longing for a baby had brought her to the decision that it was time to marry. The only question was who. Or should that be, whom to marry? She was never certain of her grammar, thanks to her father’s inability to keep a governess. Servants, it seemed, didn’t like going unpaid. Moreover, God-fearing English servants also disliked the fact that their masters danced naked in the moonlight. India winced at the memory. She had spent years trailing her parents, her vibrant, loving, half-mad parents, longing for affection, attention, even supper.… They had loved her. Surely. Everyone’s parents had good and bad sides. Her parents had loved her, which was good. They had danced attendance on a moon goddess instead of the Queen of England, which was bad. They had sometimes forgotten to feed her. That was the worst. Without question, her fear of marriage really went back to her childhood. Marriage meant trusting a husband to take care of her instead of taking care of herself. It meant accepting that he would be in charge of their accounts. The very idea of a man like Dibbleshire talking to an estate manager made her shiver. She swallowed hard. She thought she could get used to living with a man. But could she obey one? Her father had been very dear, but he had played ducks and drakes with the estate, neglecting to pay the baker’s and butler’s accounts, as well as regularly forgetting the existence of his only child. He and her mother had died during a trip to London that they took for an unknown reason, although they’d had no money for such an excursion. It wasn’t unreasonable for her stomach to clench at the idea of putting herself in the hands of a man. Still, she could do it—with one minor tweak. She simply had to find a man who was sweet and kind, and smart enough to realize that she should be the one to run their household. If she, Xenobia India St. Clair, expert at turning chaos into order, truly put her mind to the task, how hard could it be? Three Weeks With Lady X is Book 1 in the Desperate Duchesses by the Numbers series.